Thomas Ruffs Night Pictures, which are all 190 x 190 cm in size, have a greenish hue to them. He produced them using an electronic camera which intensives low-level light. They are photos which pin-point a diffuse area in which a night-time cityscape becomes visible that to my mind appears careworn. Thomas Ruffs Night Pictures have a depressive feel to them: as if the whole year consisted of one long dreary November. I have never seen photos in which the solitude in the picture converges to such a great extent with the solitude of the photographer. Ruff takes photos as if he had reccived a commission to observe. After all, who photographs such „dull“ streets, houses, walls, or a view of a canal with iron bridges so late at night? Light is solely shed by the windows or the street lamps. These are deserted pictures. Pictures with an "empty“ gaze about them. The mood is tense and yet also relaxed. The momentary freezes into permanence. The empty gaze of Thomas Ruff's pictures corresponds to a calmness, which does not exist, simply because only in the dead of night are those constant tones audible which are then drowned out during the day by the chatter of everyday life. When looking at Thomas Ruff's pictures I „hear“ a background of noise in the distance, that, though indefinable, is nevertheless present. Needless to say, these pictures are not generated at random. They merely appear to be random or arbitrary. In reality they are carefully sought out, each focal point „composed" in such a way that the random characterizes itself as such. The Other Portraits trigger the following thought. The expression of a depressive mood used in the Night Pictures can also be brought to bear here. What is involved is less the transfer of masculine into feminine and vice versa within one and the same identity, and more the brittle fragility of identity itself. The moment identity loses its protective padding, it becomes vulnerable. In order to shield itself from this vulnerability, it adjusts to the particular conditions to which it is exposed. Otherwise, the consequence would be aggression or regression. On the other hand, however, such an identity also clearly goes on the offensive: It transforms itself within an open range of selected and apparently mutually incompatible possibilities, both in terms of consciousness and in relation to action. To put it differently: Thomas Ruff puts his finger on a „schizoid state of affairs". Bill T. Jones, the dancer and choreographer, presents this problem on another plane and in connection with his Dance Poem Still/Here as follows: „None of the promises with which this century started out has been fulfilled. On the contrary: At the end of the twentieth century we have arrived at a point where we no longer have anything under control - neither starvation nor environmental problems, let alone the wars which have broken out in the last years. The impotence with which we face the HIV virus reflects the failure of progress per se." (in: Neue Zürcher Zeitung, April 18, 1995, No. 89) The relation of the coarse grain of pictures of „wanted" or „missing" persons to the feeling suggested by the Other Portraits is similar to the relation between the observer/photographer and the Night Pictures. It is as if the meanwhile obsessive body of society, which we ourselves constitute, were observing itself. The diffuse identities which Thomas Ruff shows us attest to their own incompatibility or by extrapolation they demonstrate this. I truly believe that Thomas Ruff has put his finger an the pulse of our age. And he does so from a cool distance. It is as if a „fact“ were simply being noted. The utopian moment, which Lou Reed once sang in praise of in Transformer, and it is now twenty years ago, is stripped of its own persona under present conditions. This is not swan-song rather, the boundaries of what we can endure are described. Die Nachtbilder von Thomas Ruff, 190 x 190 cm, sind grünstichig. Sie sind das Resultat einer elektronischen Restlichtverstärker-Kamera. Es sind Fotos, die einen diffusen Kreisbereich lokalisieren, in dem ein nächtliches, ich würde sagen, verhärmt erscheinendes Stadtbild sichtbar wird. Die Nachtbilder von Thomas Ruff besitzen eine depressive Qualität: als wäre das ganze Jahr trüber November. Ich habe noch nie Fotos gesehen, in welchen die Einsamkeit im Bild derart stark mit der Einsamkeit des Fotografen konvergiert. Ruff fotografiert, als hätte er einen Auftrag, der darin besteht, zu beobachten. Denn wer fotografiert schon spät in der Nacht derart „stumpfe“ Straßen, Häuser, Mauern, eine Kanalansicht mit Eisenbrücken? Licht findet sich in den Fenstern oder in Form von Straßenlaternen. Es sind menschenleere Bilder. Bilder mit „leerem“ Blick. Die Stimmung ist gespannt und entspannt zugleich. Der Moment gerinnt zur Dauer. Der leere Blick der Bilder von Thomas Ruff entspricht einer Stille, die es nicht gibt, weil nur in der tiefen Nacht jene kontinuierlichen Töne hörbar sind, die der geschwätzige Alltag tagsüber verdeckt. 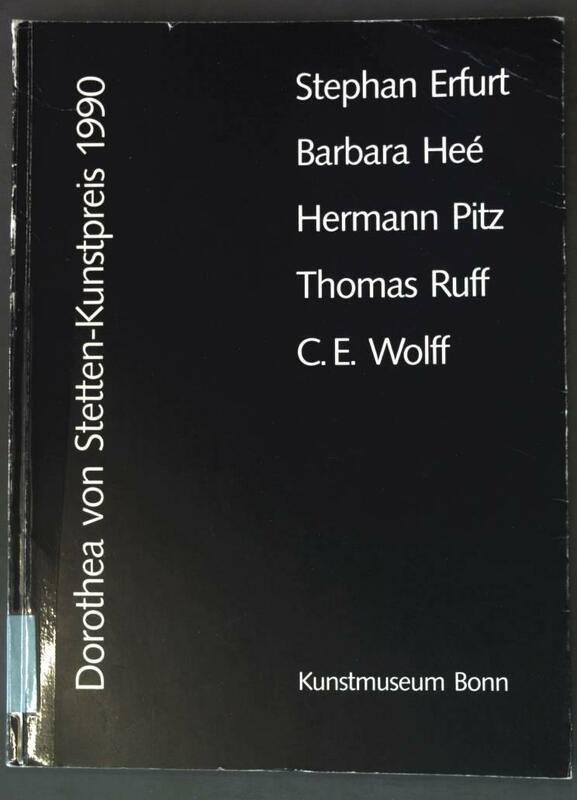 Beim Betrachten der Bilder von Thomas Ruff „höre“ ich einen fernen Geräuschpegel, undefinierbar aber präsent. Natürlich sind diese Bilder nicht zufällig. Sie erscheinen wie zufällig oder beliebig. Sie sind in Wirklichkeit eruiert, der Blickpunkt ist „komponiert“,.so daß sich das Zufällige als solches charakterisiert. Das stark aufgerasterte „Fahndungs- oder Vermißtenfoto“, wie es die Anderen Porträts suggerieren, verhält sich wie der Beobachter / Fotograf zu seinen Nachtbildern. Es scheint so, als ob sich der obsessiv gewordene Gesellschaftskörper, der wir sind, selbst beobachtet. Die diffusen Identitäten, die Thomas Ruff uns zeigt, projizieren sich in eine Inkompatibilität oder werden in eine solche projiziert. Ich denke schon, daß Thomas Ruff den Nerv unserer Zeit trifft. Er tut dies aus einer kühlen Distanz heraus. Ein „Sachverhalt“ wird gleichsam notiert. Das utopische Moment, das einst Lou Reed in Transformer besang, über zwanzig Jahre ist es her, wird unter heutigen Bedingungen seiner selbst entkleidet. Keineswegs ein Abgesang, nur die Grenzen des Aushaltens werden gezogen. Von Brauchitsch, Boris: Thomas Ruff. Verlag Hassmüller KG, Frankfurt/M., 1992.